Perched atop the Elephant, the Rider holds the reins and seems to be the leader. But the Rider’s control is precarious because the Rider is so small relative to the Elephant. Anytime the six-ton Elephant and the Rider disagree about which direction to go, the Rider is going to lose. He’s completely over-matched. Most of us are all too familiar with situations in which our Elephant (emotional brain) overpowers our Rider (rational brain). You’ve experienced this if you’ve ever slept in, overeaten, dialed up your ex at midnight, procrastinated, tried to quit smoking and failed, skipped the gym, gotten angry and said something you regretted, abandoned your Spanish or piano lessons, refused to speak up in a meeting because you were scared, and so on. 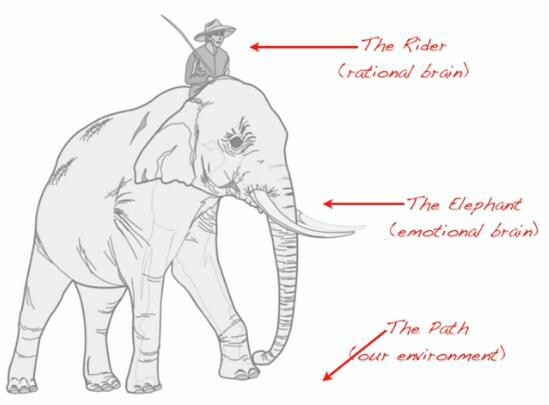 The key to effective change is getting the Elephant and the Rider moving together. Follow The Bright Spots. Investigate what’s working and double down. Script The Critical Moves. Don’t think big picture, think in terms of specific behaviors. Details help clarify the way. Point To The Destination. Change is easier when you know where you’re going and why it’s worth it. Find The Feeling. Knowing something isn’t enough to cause change. Make people feel something. Shrink The Change. Break down the change and steps needed until it no longer spooks the elephant. Grow Your People. Cultivate a sense of identity and instill the growth mindset. Tweak The Environment. When the situation changes, the behavior changes. So change the situation. Build Habits. When behavior is habitual, it’s “free” and doesn’t tax the Rider. Look for ways to encourage habits. Rally The Herd. Behavior is contagious. Help it spread. For years, I tried working out, going heavy for a few months and then stopping. Last year, I decided to take a different approach. I decided to motivate my elephant first and not listen to the rider. So my workouts weren’t optimal in the early months, but I was motivated and consistently working out at least twice a week. My goal was to just get my elephant in the habit of working out and more importantly liking to work out consistently. Over time, as my elephant got into the habit, I started training my rider on how I can achieve the best results in the shortest time: the optimal path. Currently, I’m seeing great progress week over week. I will write more about my health and fitness transformation later.